Leicester’s history-making squad will be remembered for generations to come after securing the Premier League title and among the key reasons the Foxes came out on top, was the staggering continuity of their playing personnel. Claudio Ranieri left his tinkering ways at the King Power Stadium door when he arrived to widespread murmurings of discontent last summer. In the age of squad rotation the wily Italian reverted back to basics with his Foxes side and it paid the ultimate dividend of top-flight glory. After spotting some weakness in an early version of his defence, this simplistic approach was never more evident after Ranieri settled on what turned out to be a winning formula at the back. Entrusting the same back four in front of the domineering Kasper Schmeichel in goal, consisting of skipper Wes Morgan, central-defensive partner Robert Huth and full-backs Danny Simpson and Christian Fuchs, the quintet formed the bedrock of their fairytale success. 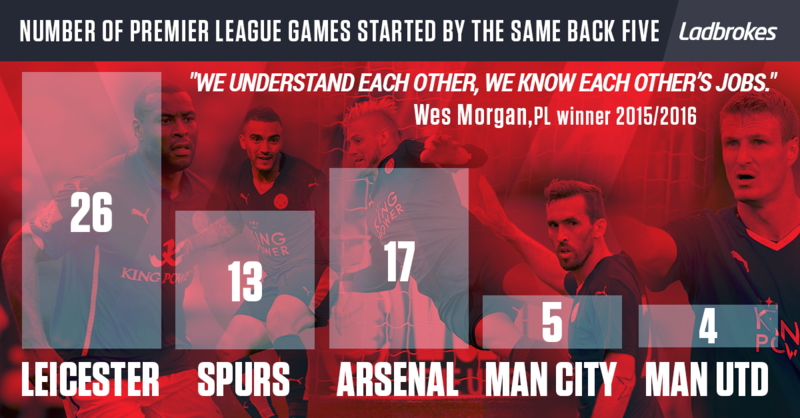 Although Leicester’s early leakiness has prevented them boasting the meanest defence across the campaign, this awesome five-some managed to start 26 of the 36 games to date in unison. Their worth was never more apparent than down the back stretch when Ranieri was able to deploy the same unit in nine matches consecutively. Six of those produced cleans sheets, with four 1-0 results in a row the definite stuff of champions. It’s really quite startling when you look at the likes of the Manchester clubs. Admittedly, both Manuel Pellegrini and Louis van Gaal were both blighted by injuries which has to be taken into consideration. However, the temptation to swap personnel, especially with mid-week European commitments to juggle clearly played a leading role in the amount of changes rung. With Leicester finding themselves thrown in among the continent’s cream next season, it will be very interesting to see how well Ranieri can resist tinkering next season.